At Montagu its not all work and no play as our next story highlights. With the help of his key worker Mathew spent some time looking through the Adult Education catalogue. They searched for the activities that would interest him. He scanned the booklet and chose a few and after much discussion Mathew thought he would like to join a Tai Chi class. Mathew already likes meditation and practices some body moves which were not dissimilar to Tai Chi. They used the internet which is connected to all houses to obtain the details of the course and printed them out. After budgeting the amount he needed, he enrolled and paid for a 10 week course. Staff accompanied Mathew for the 75 minute session. Mathew looked forward to go to his Tai Chi class. He felt empowered to be enabled to show the staff where his classroom was. He loved introducing the staff to his Tai Chi teacher. He enjoyed participating in the group. Mathew loved socialising with the group. The teacher put in all efforts to chat with Mathew and to teach him. One could see smiles and pride in Mathew’s eyes when Mathew showed his teacher and group what he learnt. 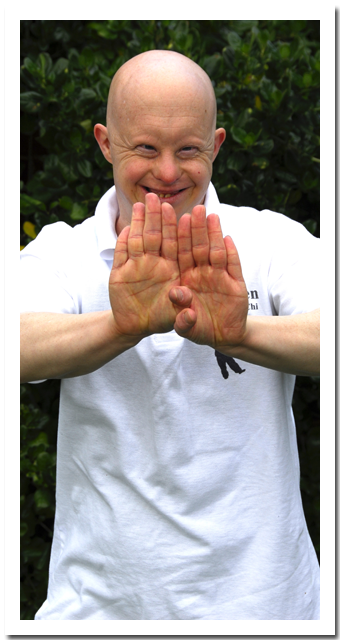 Mathew has learnt the moves and would happily perform them when asked. On the final day of his Class, his teacher presented him with a nice white T-shirt with Tai-Chi written on it and Mathew loves his T-shirt and brings it out to show with pride.